Washington is set to postpone anti-terror regulations that had threatened to block visitors from Western nations from travelling to the United States unless they had the right kind of passport. With effect from 1 October 2003, nationals from countries on the Visa Waiver Programme (VWP) - whose nationals do not normally require a US visa - would have had to travel with machine-readable passports (MRPs) or get a US visa. But the US is now set to extend by one year the target date for tightening the rules. The extension is a recognition that many passports still cannot be read by computerised scanners and that not all travellers are aware of the new rules, according to state department officials. The rules were the result of a tightening of security after the attacks on 11 September 2001, and were aimed at making it easier for officials to gather information on overseas visitors. Twenty-six of the governments concerned have reportedly been told that they can request an extension of about one year. US Secretary of State Colin Powell "is considering postponing until 26 October 2004, the requirement that each Visa Waiver Program traveller must present a machine-readable passport at a US port of entry to be admitted to the country without a visa," Melinda Sofen, a department spokeswoman, told AFP news agency. Mr Powell "has not yet made a final decision to grant this postponement to any country's passport holders," she added. State department officials said any country asking for an extension must give the United States assurances that it is making progress in issuing MRPs and is taking steps to prevent the misuse of passports which are not readable by computers. Representatives of trade and tourism organisations welcomed the offer to extend the deadline. Randel Johnson of the US Chamber of Commerce welcomed a decision which he said does not force "an unrealistic timetable for passport requirements that would cause chaos at our ports of entry". Some European countries, such as France and Spain, are reported to be struggling to provide MRPs to their nationals. Even then, only one machine would be available to produce MRPs for all French nationals living abroad, a source at the French consulate in London told BBC News Online. In other countries, such as Australia, Britain and Japan, most passports are already machine-readable, featuring two lines of text and chevrons at the bottom of the photo page. Belgium cannot apply for the extension because of US concerns about the security of Belgian passports. 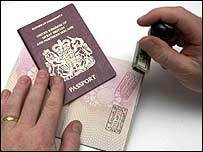 Countries in the Visa Waiver Programme are: Andorra, Australia, Austria, Belgium, Brunei, Denmark, Finland, France, Germany, Iceland, Ireland, Italy, Japan, Liechtenstein, Luxembourg, Monaco, the Netherlands, New Zealand, Norway, Portugal, San Marino, Singapore, Slovenia, Spain, Sweden, Switzerland, and the UK.